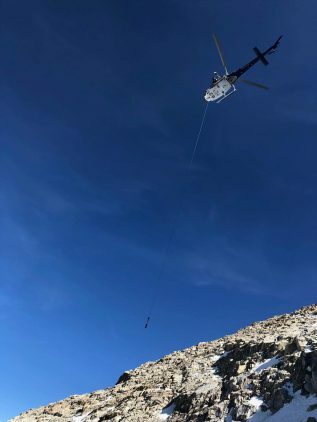 At approximately 9:30am on Sunday, June 10th Inyo County Search and Rescue was notified of an accident involving three victims above Mt. Whitney’s Trail Camp. One hiker had slipped while ascending the snow-filled ‘Chute’, a hazardous short-cut often used in the spring when the normal trail is under snow, tumbling an estimated 500’, hitting the second and third victims during her fall. Eleven team members responded and were moving towards Lone Pine by 10:30am. The team was met by CHP helicopter H-82, which had flown by the accident scene and located the patients. Due to flying conditions and the high elevation of the site the helicopter could only fly one SAR member at a time. The first team member reached the scene shortly after noon with the second and third following shortly after. The remaining team members stayed down in Lone Pine to provide incident command, communication management, and a ground team if necessary. One victim was able to get out on his own. The other two had moderate to major injuries including major head and facial trauma and pelvic and spine injuries; they were roughly 150’ apart, on a 30º snow slope. Other hikers, whose aid was essential to the operation, had stabilized the patient’s positions, preventing further sliding down the slope. SAR members, with the aid of the other hikers, were able to treat both patients and package them for transport. CHP H-82 was able to effect a hoist evacuation of each patient in extremely challenging flying conditions. Both patients were flown to Lone Pine and eventually other medical centers for further treatment. 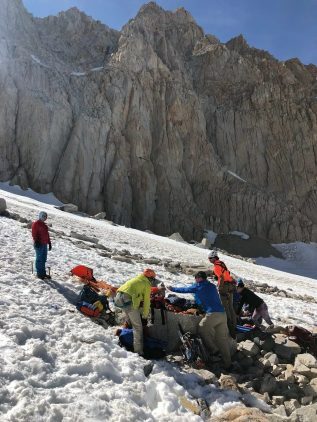 Inyo SAR would like to thank the hikers who gave up or changed their hiking plans to assist these seriously injured patients, as well as the crew of CHP – Inland Division Air Operations. Posted in 2018, Missions Reports.